Calling all parents, grandparents and any neighbor that cares that our children have a place to play close to home. PLEASE COME OUT FOR THE AIGBURTH ASSOCIATION MEETING ON MONDAY JANUARY 18TH AT 7:30 AT AIGBURTH VALE MANSION.Â THERE WILL BE A DISCUSSION ABOUT A RALLY TO HELP CONVINCE OUR COUNTY EXECUTIVE TO MOVE AHEAD ON THE PARK AT RADEBAUGH’S. IF YOU NEED TO BRING YOUR CHILDREN PLEASE DO, THEY ALWAYS HAVE GREAT IDEAS ABOUT STUFF LIKE THIS. THIS PORTION OF THE MEETING WILL BE AS BRIEF AS POSSIBLE. 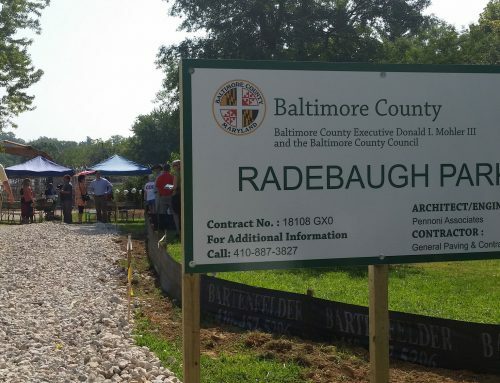 The Green Towson Alliance (GTA) is still very excited about the possibility of a passive county park on the Radebaugh greenhouse property. We have been interacting with the Radebaughs and the county government, and we would like to offer to work with the neighborhood association on this. I would like to organize a rally of the neighborhood’s children at the park in January. I think this is a great idea, as the energy and publicity generated by such a rally will help move the process forward. I have talked with the press about this idea, and they are interested in covering the event. GTA members are attending, our meeting this January 18th to be involved in discussions of ideas about the rally and what the neighborhood’s hopes and concerns are for the park?Â They will also be there to help us get our rally off the ground. Hope to see you all at our meeting on 1/18 â€” without your help I get the feeling we will never see this park!! !